Though originally from Greensboro, N.C., Josh has lived in the Myrtle Beach area for over eight years now. 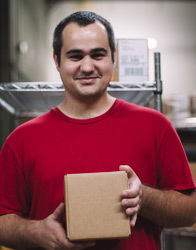 As one of our Shipping and Receiving Associates, he's constantly on the move — filling and processing orders, pulling pipes and tobacco, and packing it all up safely to arrive at your doorstep exactly the way you want it. He's currently pursuing a degree in Criminal Justice, working towards realizing his ambitions of being a detective. When he's not at work or at school, you'll likely find Josh catching up on the latest basketball game, specifically UNC Chapel Hill's Tarheels.